A-Frame provides components for loading glTF, OBJ, COLLADA. We recommend using glTF if possible as glTF gains adoption as the standard for transmitting 3D models over the Web. Components can be written to handle any file format, specifically any format that has a three.js loader. We can also try to find components in the ecosystem that have already been written to handle other formats (e.g., PLY, FBX, JSON, three.js). Models come in the format of plain text files containing vertices, faces, UVs, textures, materials, and animations. They also come with images for textures, usually alongside the model file. three.js loaders parse these files to render them within a three.js scene as meshes. A-Frame model components wrap these three.js loaders. We can use Don McCurdy’s animation-mixer component to play a model’s built-in animations. Animations usually come in the model built via animation tools or programs rather than being provided at the A-Frame level. The animation-mixer component may be merged into A-Frame’s core in the future. Refer to Hosting and Publishing — Hosting Models. Before anything else, check your console for errors. Common issues related to CORS can be solved by properly hosting your models and the console will also tell you if your model needs additional files that are missing. If there are no errors in the console, try scaling your model down. Often times there’s a mismatch in the scale when you export, and this will cause the camera to be inside the model, which means you won’t be able to see it. If this doesn’t work, open the Inspector by pressing ctrl + alt + i and zoom out to verify the model is actually there. Sometimes textures just won’t work right off the bat. This is usually because exporters use absolute paths like C:\\Path\To\Model\texture.jpg or /Path/To/Model/texture.jpg for textures, which won’t work on the Web. Instead, use relative paths like texture.jpg or images/texture.jpg, relative to your model or .mtl file. The animation-mixer component, part of aframe-extras by Don McCurdy, provides controls for playing animations in three.js (.json) and glTF (.gltf) models. A common issue with models is incorrect orientation of normals. You’ll know you have an issue with normals if some of the faces on your geometry are transparent, or there are “holes” in the mesh. Turn on backface culling in the shading section of the properties panel (n) to get a better idea of which faces are incorrect. Press <ctrl> + n to make normals consistent. If it looks like the opposite of what you want, flip them via the toolbar (t). We may notice that when we import a large file or complex model, the browser will slow to a halt or not even load. Complex models that were designed for high fidelity renders aren’t ideal for real time applications. However, there’re some things we can do to make them more performant while retaining their appearance. Move around our scene and test different scenarios while keeping an eye on the graph and be sure to test on different hardware. A development PC will most likely have an easier time handling the scene than a smartphone. If we’re noticing that we’re not reaching 60 fps, try removing different elements in the scene until we find the culprit. If the performance-offending entity is a 3D model, we can try to optimize it. One of the biggest factors for scene optimization is model complexity and face count. The less geometry, the better. 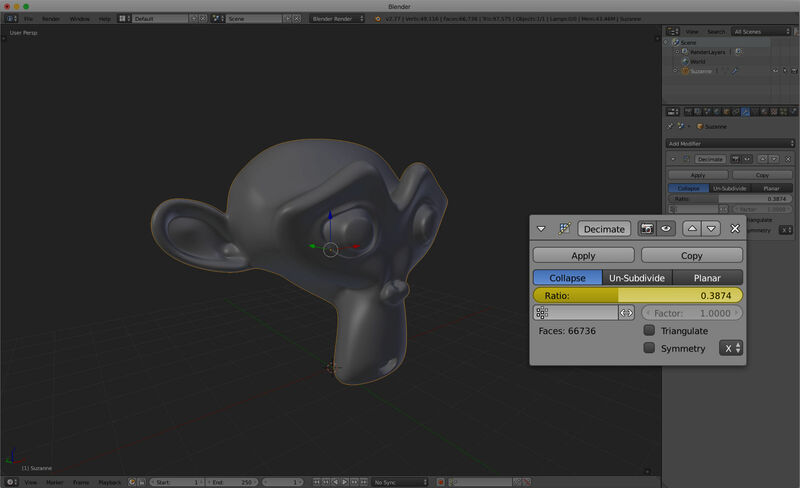 A quick way to reduce the number of faces on a model is with the decimate modifier in Blender. The decimate modifier reduces the amount of geometric faces while retaining the model’s UV coordinates. Nothing beats proper modeling techniques, but the decimate modifier can be a great last resort to make poorly optimized files run smoother. The settings for the modifier will be highly dependent on the model and how much detail we wish to remove. Adjust the ratio (highlighted) to reduce the number of faces. We may have to manually fix some of the faces at the end of the process. After we’re happy with the results, save a copy, and export to our desired file type. Test it out, and adjust as needed. Note that we may have to apply the modifier before it will take effect.